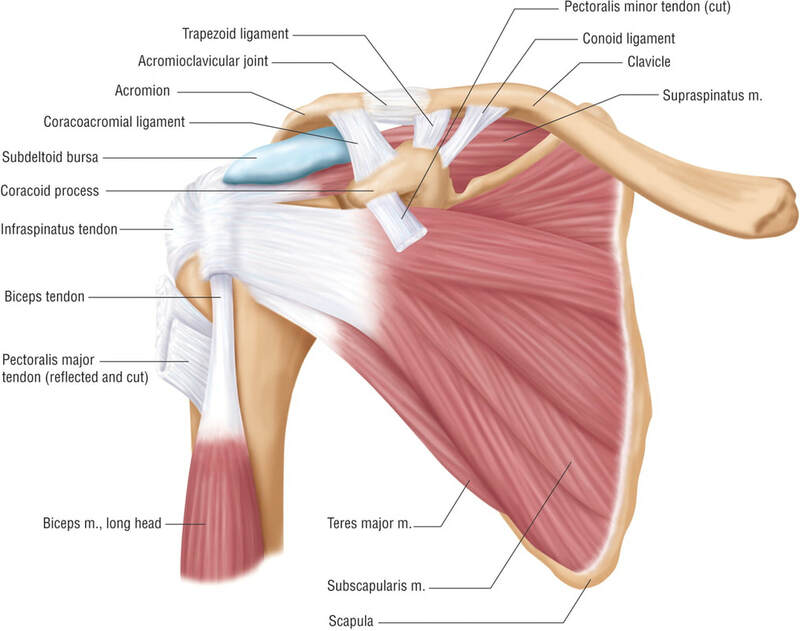 The shoulder is one of the largest and most complex joints in the body. The shoulder joint is formed where the humerus (upper arm bone) fits into the scapula (shoulder blade), like a ball and socket. [Editor's Note - actually the ball of the humerus fits into a shallow dish - rather than a socket, which is the reason for such a large Range of Movement. Further, it is the reason shoulder dislocations are reasonably common and why rotator cuff problems are so prevalent - but fixable] . [Non-surgical solution - Contrary to popular belief, it is usually the muscles which surround the joint that cause the pain. You may say, 'in my case it is the arthritis, because my doctor showed me the wear & tear in an X Ray.' Yes, there is wear and tear, as there is in almost everyone. Yet not everyone has pain, which is because not everyone has muscle imbalances that cause the shoulder to function incorrectly. The combination of muscle imbalance, and referred pain from neural entrapments is the cause of most pain in the shoulder. This condition is seen frequently in the clinic, and treatment usually results in full, pain free ROM [Range Of Movement]. Rheumatoid arthritis: Is a disease in which inflammation (pain, heat and swelling) affects the joints and other organs of the body. The hands, feet and knees are commonly affected. Stiffness in the joints is common, especially in the morning. There is no cure for rheumatoid arthritis but there are ways to manage it. A rheumatologist may prescribe a number of different medications depending on your symptoms and the severity of your condition. Non-steroidal anti-inflammatory drugs (NSAIDs) are commonly prescribed to reduce pain and inflammation. The disease-modifying anti-rheumatic drugs (DMARDs) are a special group of medications used to treat inflammatory arthritis. Biological DMARDs are the newest class of arthritis medication and work to stop the disease progressing and causing structural damage to joints. Often you may be on a combination of medications. Rotator cuff tear: A tear in one of the muscles or tendons surrounding the top of the humerus. A rotator cuff tear may be a sudden injury, or result from steady overuse. 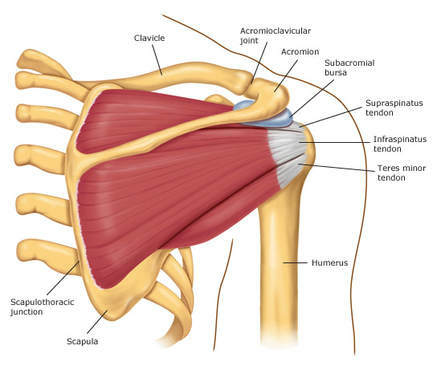 The rotator cuff is a group of four tendons and muscles that converge around the shoulder joint at the top of the humerus, the upper arm bone above the elbow. Together, they form a ''cuff'' that both holds your arm in place and allows it to move in different directions. While your shoulder is one of your most mobile joints, it's also somewhat weak. Too much stress -- or too many fastballs -- can cause partial tears and swelling in the tendons of the rotator cuff. Abrupt stress may even cause one of the tendons to pull away from the bone or tear in the middle of the tendon. A ligament, called the coracoacromial ligament may be cut. 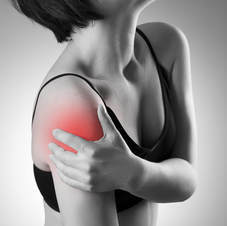 Shoulder bursitis: Inflammation of the bursa, the small sac of fluid that rests over the rotator cuff tendons, results in pain with overhead activities. See bursa in diagram above left, and read-on to learn how to overcome these conditions without surgery (usually). The diagram above right illustrates the muscles that form the rotator cuff, and how lack of adequate strength/stretch in opposing muscles will cause excessive pressure on the bursa = Bursitis. [Non-surgical solution - People with rotator cuff problems usually have tight/stronger chest muscles and internal rotators of the arm, and overstretched/weaker upper back muscles, i.e. lateral rotators of the arm. Therefore, it is important to stretch the chest and strengthen the back. Specifically, stretch Pectoralis Major/Minor and Subscapularis muscles, and strengthen the lateral rotators of the shoulder, such as Teres Minor and Infraspinatus, plus the stabilizing muscles of the Rhomboids and the lower fibres of the Trapezius muscle. The correct treatment is to correct the biomechanical dysfunction by releasing the Trigger Points in the Infraspinatus muscle, the Pectoralis Muscle, and the Subscapular muscle. Bear in mind that the correction process involves strengthening the lateral rotators of the shoulder and stretching the internal rotators. This may invite the question as to why then are we massaging/stretching all the rotator cuff muscles, rather than just those that need stretching? The answer lies in creating an environment in which the body's innate healing mechanisms are activated, i.e. blood flow is enhanced by massage, as is the migration of white blood cells to the site of the active trigger point/s where they will relieve pain by removal of the inflammatory proteins. The active trigger point itself has to be deactivated to inhibit its action of referring pain to multiple sites, such as the front of the shoulder, to the posterior deltoid, and down the arm, etc. Incidentally, if you are have been diagnosed with Carpal Tunnel Syndrome, you may in fact not have that condition at all, but rather Rotator Cuff Syndrome that is referring neural impulses into the median nerve distribution of the hand.